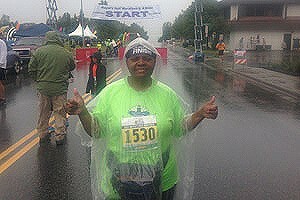 Frances Garrett gives a thumbs up sign at the Mayor’s Half Marathon in Anchorage, Alaska. It’s a simple explanation that tells you a little about this registered nurse and one of the hospital house supervisors at KP South Sacramento. But what you may not know about “Miss Frances,” as she is known, is that she has accomplished a huge goal: taking part in more than 50 organized races—at least one in every state—over the last three years. Setting the goal was a response to a tragedy in Garrett’s life: the loss of her daughter in 2006. “I was just so devastated. I couldn’t get life going,” she said. To cope with the grief and to honor her daughter, Garrett set the goal of running a race in every state. But she wasn’t a runner and, at 55, and weighing more than 300 pounds, fitness did not come easy. She was pre-diabetic and on medications for high cholesterol and high blood pressure. “I had to walk a few steps, then stop. Then I would build up. It took six months of training before I could really run,” said Garrett. She lost 20 pounds initially. Then she had gastric bypass surgery. Her weight loss led to better eating habits, more exercise, and a lot more energy. “I felt like there was nothing I couldn’t do,” she said. Her first race was in 2011, running 26.2 miles in the San Diego Rock ‘n Roll Marathon. Since then, Garrett has completed several full marathons, half marathons, as well as 10k and 5k events, until she completed her 50-state goal in September. Sometimes family, friends, or co-workers travel with her, but most of the time she goes alone. There have been a few setbacks and injuries. But Garrett didn’t quit. She simply adjusted her goal and went a little bit slower as needed. She does each event with a combination of running and walking. To meet her goal and to be healthy, Garrett runs six days a week and cross trains at the gym four times a week. She wakes up most mornings at 5 a.m. to run four to six miles, depending on her work schedule. Every other Saturday, she runs 10 miles. That regime may not work for everyone. But Garrett says the key is come up with a schedule and stick to it. By sticking to her exercise routine, Garrett has lost a significant amount of weight and has stopped taking all medications. Angela Cason, a respiratory therapist at South Sacramento, says Garrett inspired her to start running and working out, too. “I wake up at 3 a.m. and go to the gym at least five days a week. I have done several 5Ks and a half marathon. I can’t express enough how much Frances has influenced me,” said Cason, who has lost 30 pounds since August of last year and feels great. Garrett is not done. Her new goal is to finish two half marathons a year. She’ll do one in January in Bermuda.